There are several large trucking companies that now hard wire the headlights to turn on if the truck is not in neutral. One of the big ones simply did it because they thought it would help safety with almost no dat ago back it up, their rate of crossing accidents dropped 90% the first year. So now its just standard with many companies.. I like them but I wish they would put a simple easy switch in to turn them off, because sometimes I want to park or work on my car without any lights on..
You could wrap a string around the #25 fuse (red circled) for quick release. Last edited by wasserball; 12-05-2016 at 05:30 PM. The owner's manual lists 2 fuses for the daytime running lights. 7.5 amp fuse (fuse #17) in engine compartment box A (near the brake fluid reservoir) and 7.5 amp fuse (fuse #25) in the cabin box A (the non-covered box behind the instrument panel). It says the fuse puller is located on the "back of the engine compartment fuse box cover" but doesn't say which box. OK I found it in box A. However the space in engine compartment box A, space 17, is empty. 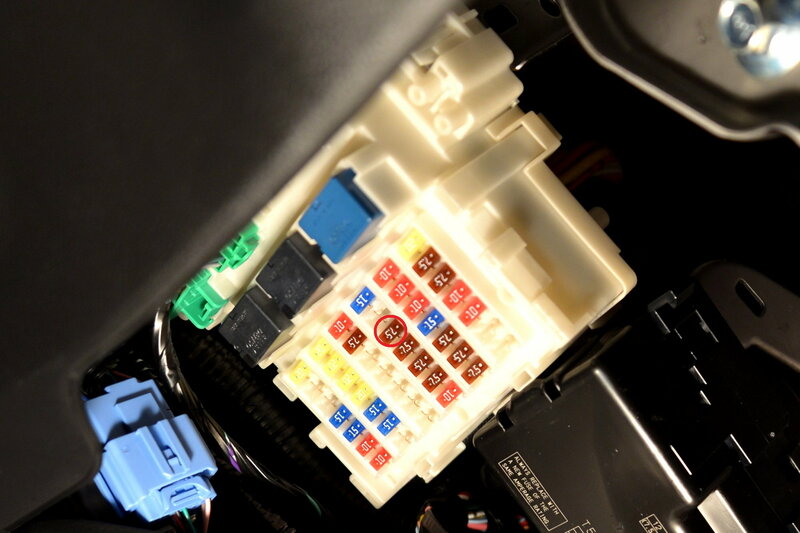 I wonder if the engine compartment DRL fuse is for an non-US model Fit or Jazz, that has LED headlights that are lens-focused (projector beams), and separate lamps for the DRL's, and if the fuse in the cabin box A, are for models with DRL's that work by sending lower voltage to the 12v halogen headlights that are reflector-focused. Last edited by nomenclator; 10-12-2017 at 09:00 AM. A zillion years ago a car magazine (I think Car & Driver) reviewed a Nissan that was gray- they said for some reason people kept cutting it off. Then I bought a gray car and noticed the same thing. I agree- it blends into the road and is less noticeable. nnnn, i think its the shape of the GK. people perceive dese cars as slow and want dem out of their way. mine is white and people cut me off all da time..or speed up when i want to change lanes. and its not like im driving slow either, just following traffic. fully disrespected. without power cant really dig into the lane next to me either.. I went from a gray Infiniti G-20 to a blue 2010 Fit and the cutting off went way down. I agree with this. I be cruising 75-80 and people still want to go around me. I read something back in the '90s, that the GM DRLs took half a HP to run. And, because of that, GM got the OK to do EPA gas mileage ratings WITH THE DRLs OFF. It's not as much as an issue these days with LED DRLs. Energy being equal, and assuming 55w headlamp bulbs being run at half-power, alternator and battery in good shape, fortunately the parasitic power loss at the crankshaft would be .07 hp. Or seven one-hundredths of a HP, less than the mechanical tolerance to even measure it, much less have any effect. yah, yesterday i took the GK out to run an errand in da pm and sure enough, some faker in a charger behind me passed me only to cut me off while i was going 50 in a 45mph with everyone else. Here in the dark and rainy canadian north-west DRLs are both a blessing and a curse. I see dozens of cars at dawn/dusk/night with no taillights... I wish automatic driving lights were mandatory just as DRLs are.